The most famous sports car to come out of Italy has to be the Ferrari. Founded in 1929 by Enzo Ferrari in Maranello, these cars, with their famous prancing stallion symbol, represent speed, style and luxury. If you’re a fan of the Ferrari, then why not enjoy the thrill of taking part in a Ferrari driving experience in Italy? Before you hop into the driving seat though, why not find out more about this incredible car? The official Ferrari museum in Italy is located in Ferrari’s home town of Maranello, around 300 metres from the actual Ferrari factory itself! If you choose a Tuscany holiday rental near Florence, you’ll be about 2 hours away from this popular museum, which is dedicated to all things Ferrari. This large exhibition space is comprised of 6 main halls, which include, as well as actual cars, trophies, formula one helmets and suits. There’s also a semi-professional simulator and a great Ferrari store too, so you can pick up some Ferrari merchandise while you’re there. You can wander around the museum as you please, or you can take a guided tour, but make sure you book in advance if you want to do this. Tours of the nearby Fiorano test track are also available too. If you didn’t already have the urge to get behind the wheel of a powerful Ferrari, you definitely will after seeing some of these incredible machines in Maranello. There are a number of companies who organise Ferrari driving experiences in Italy, several of which are conveniently located in Tuscany. 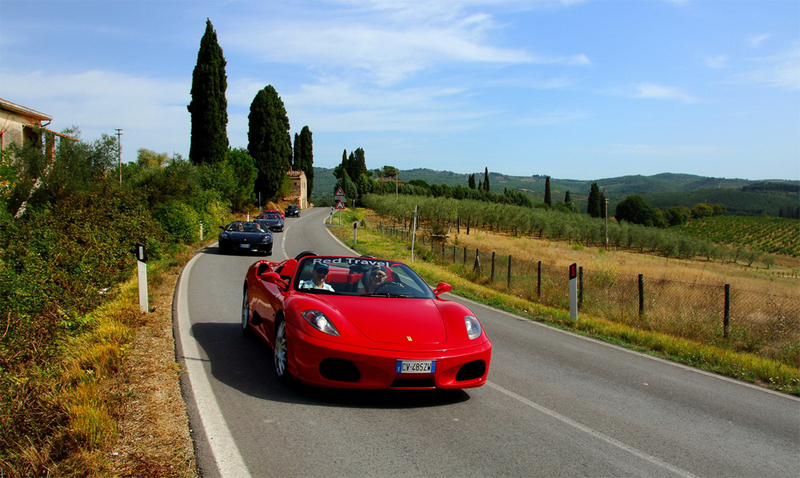 Tuscany In Tour offer a great full day experience which leaves from Florence, and heads to the Ferrari factory and museum, before offering (at an extra cost) a thrilling 30 minute drive in a Ferrari F430. And if that’s not enough, a visit to the Lamborghini factory in Modena is included too. ZuzzinTuscany also have a selection of day tours from Florence, including a trip around the Chianti region and San Gimignano in a Ferrari, or a tour of Montepuliciano and the stunning Orcia Valley. And if you’d rather explore the panoramic Tuscan roads by yourself, then that’s possible too. Why not hire a Ferrari and view the stunning scenery at your leisure, stopping off at enchanting little towns and wineries? There’s no better way to discover this area than in a top class Italian car! With a company such as Europe Luxury Car Hire these fantastic sports cars are available to rent for a day, weekend or even longer, from all the major Tuscan cities, and a selection of models are available. So, fancy revving up your holiday a little? As well as enjoying your fantastic villa to rent in Tuscany with its private pool, why not get yourself in the driving seat too!